Editor’s note: What does it take to put together an email? How do you take all the components we write about week after week, and put them together to create a thoughtful, well-executed campaign? We asked our in-house email marketing specialist, Reid Yoshimoto, for a breakdown on his process creating our bi-weekly newsletter, the VR Buzz, to share his expertise. Twice a month I put together the VR Buzz newsletter, and each time I treat it as if it were the first email I’ve ever sent. 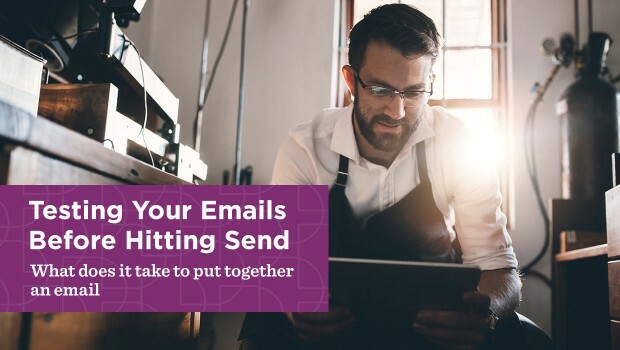 Creating an email campaign seems like a piece of cake, but in reality there are a lot of moving parts that need to come together before clicking “send.” We all have some experience with email not working the way it was supposed to. Have you ever emailed (or Tweeted) a company when their links didn’t work, or received an “Oops” email after a company sent you an email with the wrong information in it? What will this email really look like? Sending a test to yourself, friends, or co-workers is one of easiest ways to view your email before finalizing your campaign. You might say, “Yes, it looks great,” but ask yourself additional questions like: Do I want my customers spending a lot time scrolling and looking for things? Would the use of colors help the text be more eye-catching? Are the images appropriate for the message I’m conveying? Most importantly, is the email responsive in both desktop and mobile versions? Test all links, images, and buttons in your email even if it’s a template you’ve used a thousand times. Then test it all again. Taking five minutes to check your links helps ensure your customers save time and go to the page they expect to when they click, such as your checkout page versus your home page. And if you’re placing tracking on your links, make sure those are set and appear correctly too. Do the images complement the content? Make sure your image(s) enhance the story you’re telling. If you’re a restaurant trying to bring in brunch business, don’t show a picture of your dinner menu. People are visual, and that photo of eggs Benedict or stuffed French toast may be your selling point to get them to book a reservation. Is this the best subject line for this email? Don’t be dull. Email marketing might not be the sexiest topic out there, and sometimes we have to get straight to the point, but when possible, give your subject lines (and copy) a voice. Throw in some humor on occasion. Customers need to see a human side to you, and they will remember an email if there was a creative subject line attached to it. Is this email right for my subscribers? Test one version of an email against another. Testing your email doesn’t mean just looking at two emails and saying, “This one is great,” or “I like this one better.” It means sending two versions to see which one resonates better with your customers. It’s not hard to do: Create two versions of your email, and segment your main email list into two random groups. Group A receives version 1; Group B receives version 2. Once you have results from your two versions, you can pick the “winner,” and format future emails knowing what your customers like. Do they prefer short, image-heavy emails over text driven ones? You may be surprised what resonates with your customers. The “better” email isn’t always the one you prefer. Taking a few minutes to ask yourself these questions before you hit “send” will save you a ton of time in the long run — and save you a lot of “Oops” moments.